Rural health clinics now must report revenue codes, HCPCS codes, and charges for all services on separate lines outside of the qualifying visit line—a significant change from CMS’ traditional billing rules for these providers. Proper reporting of revenue codes, HCPCS codes, modifiers, and charges for qualifying visits, items, and services is now more important than ever. Many RHCs have struggled to adapt to CMS’ extensive billing changes, causing revenue flow problems. Combined with the unique staffing requirements and qualifications RHCs must meet, the challenges these unique and vital providers face can seem overwhelming—but they don’t have to be. 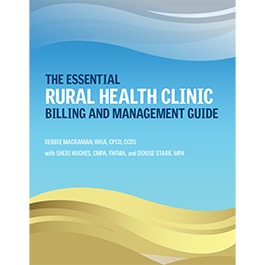 The Essential Rural Health Clinic Billing and Management Guide breaks down RHC rules and regulations in an easy-to-understand format. This resource outlines how to meet the RHC designation, addresses the challenges of practice management at an RHC, and explains the latest RHC billing regulations and their impact. This book includes case studies to help RHC staff put CMS’ rules in a practical context and understand their role in ensuring all requirements are met. Downloadable forms, including example UB-04 claim forms, modifier selection flowcharts, and a flowchart for RHC revenue cycle management, supplement the information in the book and provide customers with a complete set of resources. The tools and reference material make this book an ideal reference guide and self-paced training supplement. Debbie Mackaman, RHIA, CPCO, CCDS, is the developer and lead instructor for HCPro’s Medicare Boot Camp®—Critical Access Hospital Version and Rural Health Clinic Version and an instructor for the Hospital Version and Utilization Review Version. She serves as a regulatory specialist for HCPro’s Medicare Watchdog Service, specializing in regulatory guidance on coverage, billing, and reimbursement for hospitals, physicians, and other healthcare providers. Mackaman has more than 24 years of experience in the healthcare industry, including expertise in conducting coding and billing compliance audits, performing charge description master reviews and maintenance, and providing oversight of documentation improvement programs. She has served as compliance officer and director of health information services for healthcare systems, and is a nationally recognized speaker on a variety of compliance topics for national and local organizations and revenue cycle events. Sheri Hughes, CMPA, FHFMA, brings more than 40 years of experience in revenue cycle management to the health care consulting practice at Moss Adams. Prior to joining Moss Adams in 2008, she led revenue cycle operations at hospitals, health systems, medical groups, skilled nursing facilities, and ancillary providers. Hughes spent 22 years at Hoag Hospital in Newport Beach, California, a hospital that is continuously ranked among the nation’s top 100. Her experience includes reviewing operational and financial systems, as well as processes, including charge capture, billing, and payment reconciliation functions. Most recently, she worked with organizations on operational improvements and new system implementation and optimization. Hughes is well- versed in industry best practices for these functions and helps clients capture accurate coding and data to enhance and improve operational efficiencies. Hughes reviews processes and risk areas in systems to improve overall revenue function. She frequently integrates training and support for charging, coding, and billing departments. Denise Stark, MPA, has helped hospitals, healthcare systems, multispecialty physician groups, clinics, home health agencies, and skilled nursing facilities improve cash flow and boost productivity for more than 20 years. She has expertise in a wide range of healthcare revenue cycle operations, such as patient access, revenue cycle management, patient accounting, denials management, consulting, CDM, process improvement, and financial operational protocols. She conducts operational assessments for various healthcare entities, including measurement and analysis of key performance indicators, benchmarking, and performance in accordance with industry best practices. Stark has implemented revenue cycle redesign initiatives as well as process improvements and restructuring to achieve improved cash flow. She has prepared education and training related to patient access, billing, and follow-up to optimize revenue cycle operations. Stark has experience evaluating, developing, and implementing new or existing computer system applications to improve accounts receivable. Previously, Stark held various key revenue cycle management positions within health system corporate offices, hospitals, and medical groups. She is experienced with systems including SMS Invision, Relay Assurance, Epic, Meditech, and Paragon. Stark has a master’s degree in public administration (MPA) from the University of Arizona and a BS in pre-medicine from Loyola-Marymount University.